Have you experienced a difficult situation, finding a person in the contacts in your phone or email? Due to the different messages you received that make your email inbox became cluttered. Google Contacts is the best answer for you. This app is useful for your business contact or even useful for your personal use. "This is a management tool that available in your Gmail account. It's a standalone application of the internet that part of Google Business oriented site." How to get this Google Apps? This tool is available after you register with Gmail. If you have no gmail account, all you need is to register. You can also sync your Samsung android phone contacts to this application. Follow the instruction below to sync your phone contacts. Click the Apps button below of your phone main menu. Open the gear button or the settings button. Scroll down and find the "Cloud and Accounts" and open it. Then find your Google button which your email is also displayed. Note: If you have not added your Google account in your android phone just press Add Account then press Google and follow the onscreen instruction to create your account right in your phone. If you have added Google account now sync your account, just click Sync Accounts. 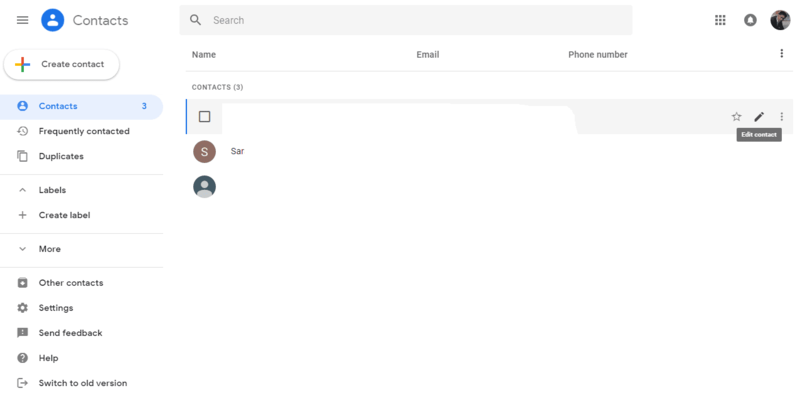 Scroll down and find and click Sync Contacts. Just wait several minutes to finish the task. When you open your Google Contacts in your browser. You can manage now this APPS. Below are the main functions of the interface of this application. CREATE CONTACT BUTTON- This a button once you click it will open a pop-up window that you can type a several important information of your contacts. Like the First Name and Last Name, Phone number. LIST OF TOOLS TO MANAGE- These are the most common tools needs, like you want to look who are the persons of your contacts that you frequently contacted, You can check also if you have duplicate contacts, and other contacts listed in your email. You create also labels to easily search. Manage Tools at the right side of your screen- This is the tools you can use to edit the list of your contacts. Example one of your contacts have no phone number you can use these tools to edit to add the phone numbers. Also use these tools to delete the a contacts. 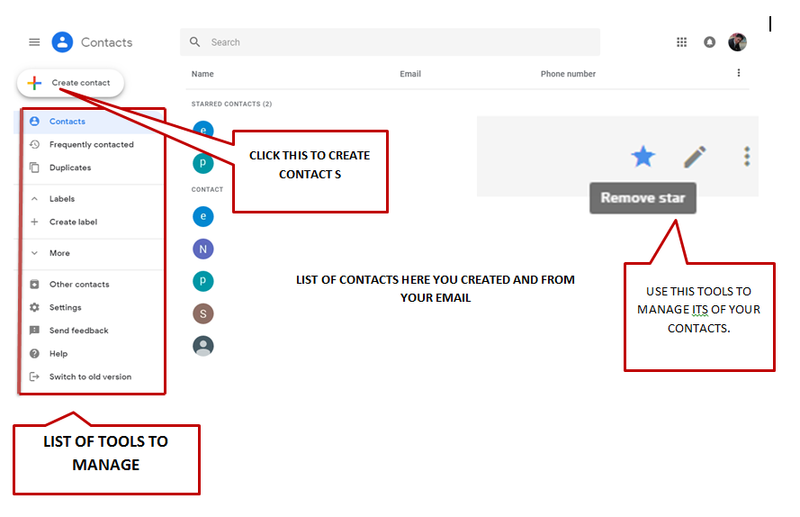 If you want to complete the information of the person you wanted to add to your Google Contacts just fill-up the important fields here below. First click the CREATE CONTACT BUTTON. A pop- up window will display, Enter the first name and the last name of that person, company, job title, email address, and phone number, you can also type a note for this person. If you want to add more fields, just click the More Fields below. And save your works after. 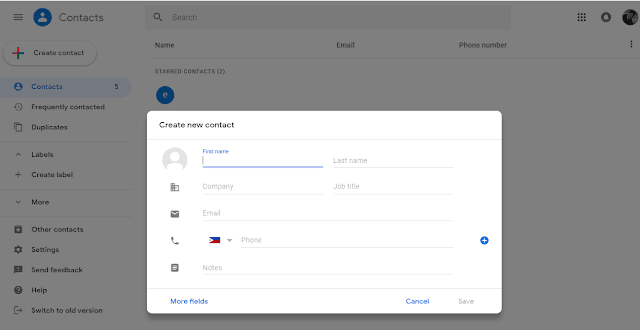 As of now this Google Contacts is a newest version that uses in internet. This was initially released three years ago, sometime on March 3, 2015 and it's part of an Android web browser. And was stable release early this year on August 29, 2018. This APPS this time is very useful that can help so much in sorting the many emails and phone numbers, including the complete information of the person that serves as your contacts. Think if you're a businessman the complete contacts in your phone and in your emails is very important.